That's it! I've had enough of it. People have been trashing Greenland ever since pretty much the dawn of time. “Iceland Jr.,” “Denmark's ugly stepson,” “Barren wasteland where there's absolutely no people, nor culture except becoming frozen to death in the horrendous wastelands of bodies,” and “Fritz.” All of these are some of the horrible descriptors lobbed at the most peaceful and wonderous of provinces. Take that, Ontario. We need to embrace Greenland as not a boring province of Denmark, but as the future of all things great in this world. Anyone who claims the Mercator projection is wrong, is wrong. 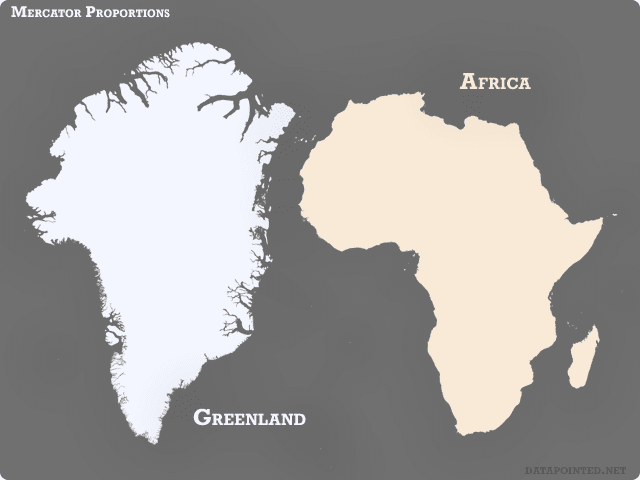 Greenland is actually much larger than Africa. Here is proof. In the interest of full disclosure, the fine people at the Greenland Department of Get People to Go Where It's Absolutely Bone Chilling Cold (GDoGPtGWIABCC) definitely didn't pay me off to write this positive account of the bone chilling cold, this entire post is written as an act of love. An act of love for Greenland. Where else can you go that looks disproportionately huge on a Mercator projection map? Don't even try and claim Antarctica. Greenlandians dislike that fake continent for trying to horn in on its greatness. But that's neither here nor there, Greenland is filled with love for all things—minus Antarctica... stupid penguins. Greenland affords many opportunities not available elsewhere. As the vikings knew, you can wake up listening to ABBA music, spend all day playing on a stegosaurus and go to sleep where they shot the Lord of the Rings trilogy. No other place can claim this, especially not Sweden nor New Zealand. Another great aspect of Greenland—there's no murder. Not because the people there are so kind and docile (which they are) but it's literally impossible to murder someone in this finest of lands. Getting poisoned, shot four times, beaten badly or wrapped up in a carpet and tossed off a bridge has no affect in Greenland. The happy air absolutely prevents death in a way that Rasputin could only dream of having. You can feel free to bring some of your worst enemies to the gem of the Arctic Ocean and guillotine them to your hearts content, because they're just not going to die. Greenland wouldn't allow it. Well, that is the mystical underlord who rules over the land wouldn't allow it, but I'm not supposed to talk about him and his nefarious scheming. So I won't. Greenland rules. Aside from the underlord (who I've only hypothetically talked about) I've noticed there are some other rabble rousers like Andrew Bird with his folksy form of irreverent faux protest have derided Greenland as a place where “souls go to dry out.” Apparently he bases this claim on the supposed extreme cold of the area, but this just doesn't hold up upon closer inspection. What's really great about Greenland is it actually doesn't get cold. This isn't like the “It's green” advertising slogan the vikings tried using back at the turn of the millennium. Anything some people might call “cold,” we just refer to as “Happy Air.” And boy, is it happily fun! There's a lot of happy air in Greenland. A whole lot. So, I bet you're feeling awfully silly for having such a negative image of Greenland for so long, right? I'm quite happy I could straighten you out on this issue. If you want to just turn over your life and move to Greenland right at the end of this sentence, that's really no surprise. Go ahead and do it. Sure, I haven't technically moved to Greenland, I've basically moved there in my heart of all hearts. And you should too. Except, you should actually move there, because Greenland is just about one of the best places to ever exist. Thank you all you fabulous Greenlandians, all 56,000 of you, you make a phenomenal province and a fantastic place to live. And thank most of all to the GdoGPtGWIABCC, I love you.